If you haven't learned it already, fooling a whitetails nose is one of the hardest challenges that any hunter faces when it comes to being a successful deer hunter. The simple fact is that if a deer gets a whiff of your scent, or any scent that isn't natural to the area, the game is pretty much over. No deer gets to live to a ripe old age by ignoring his "sniffer", and very few will take any chances when they smell something they do not like. Keeping our human scent away from the whitetails nose is a complicated task, especially when it comes to the bigger bucks. A big buck's sense of smell is his best tool for detecting danger long before that danger becomes a problem for him. If he is alerted in any way, be it a small sound, a glimpse of movement, or simply a feeling of unease... a big buck will circle up wind to catch the scent of what may have peeked his interest. Scent reduction, or masking your human scent, is your best chance of outsmarting a whitetail. All the camouflage in the world can't hide your human scent. But, the good news is that there are ways of reducing or masking the human scent on your body, your clothing and your equipment to increase your chances of harvesting that trophy buck. Wash your hunting clothes in a non-scented laundry detergent and store them in scent free containers. Hats, gloves, jackets, socks and anything else you plan to carry in the woods. Air drying your clothes outside is best, but if you must use the dryer make sure not to use any fabric softener and remove any lint from the dryer lint trap before drying. Make sure to store your clothes in a scent free container to help keep them from any attracting any outside odors. There are numerous scent free bags available on the market that will keep your clothes odor free during the hunting season. I highly recommend investing in some odor eliminating clothing such as a Scent-Lok or Scent Blocker suit. They can be pricey, but are well worth the investment for trapping human odor. Probably one of the most neglected items when it comes to scent elimination. If you think about it, every step you take in the woods, your boots come in contact with earth and have the potential of leaving odors along the way. It is very likely that deer will cross your trail sometime during the hunting day. 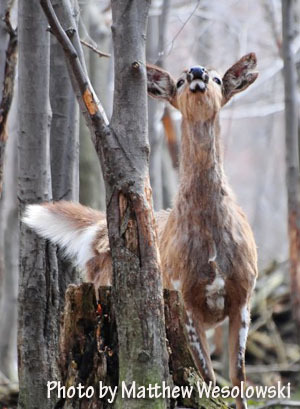 If your boots are leaving scent its also very likely those deer will be alerted long before you'll get to see them. Wearing rubber boots whenever possible is best because the rubber won't hold odor as well as other boots. But if you prefer another type of boot, make sure you treat the boot with a cover scent or odor eliminating spray. Be sure to spray the entire boot, sole and all. Store your boots in a scent free container just like you do with your clothing. Nothing smells worse to a deer than human body odor. Not paying attention to how you smell is a sure way to have an unproductive day in the woods. Before hunting take a shower using scent free soap and shampoo. There are even scent free deodorants on the market that will help as well. DO NOT use any cologne, perfume or scented soaps or deodorant, unless you don't plan on seeing any deer that day! Using some baking soda to brush your teeth is a good idea too. Anything you plan on carrying into the woods with you must also be scent free. That means your gun, tree stand, fanny packs, bags, etc. Using some kind of scent neutralizer spray or a good cover scent is the best way to reduce odor on these types of items. Remember, reducing your scent increases your chances of seeing deer, especially when it comes to big bucks. Learning how to trick a whitetails nose is the secret to a successful deer hunting. Even with all the above mentioned ways of reducing and masking human scent nothing works better than playing the wind. Being aware of wind direction and keeping yourself downwind while approaching your stand, or hunting area will increase your chances of not being detected by the ever alert whitetail deer. Using the wind to your advantage along with good scent control practices will help give you an edge in the battle of hunter vs. the keen whitetail nose.